Stories about heroic pigeons, poisoned cakes and living with a stammer were among the winners at this year's 500 Words competition. Now in its fifth year, the BBC Radio 2 contest challenges under-13s to write a story about any fictional topic. A record 120,421 entries were received, with thousands of volunteers helping to whittle down the entries. 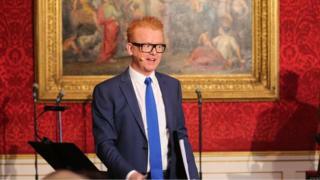 Chris Evans unveiled the six young winners in a live broadcast from St James's Palace. "Every single young writer in this competition deserves a round of applause, a hats off and a whopping well done for creating such sensational stories," he said. "They've all been so moving," said teacher Jen Morgan, who helped judge the prize. "It's just a privilege to read some of them." Sofia Zambuto's gold award-winning story recounted a mother's desperate attempt to save her family from what appears to be a tsunami. "Children we must move now," she wrote. "We must leave our home now. We must find a new home. The wave, the flood is coming again. Run with me now, as fast as your legs will carry you. Follow me now." Judge Charlie Higson said the nine-year-old had "managed to achieve a piece of mature action writing, which is a very difficult thing to do well," and praised the "fantastic twist". Zambuto had missed the deadline for the 2014 competition by 30 seconds. "I'm kind of pleased I missed it now," she laughed. Image caption Evans said the entries included "sad sheep, spooky spectres and superhero sausages, all written in just 500 words"
The top prize in the older category went to 10-year-old Amabel Smith's It's A Wide World, a story set in a not-too-distant future where the "government uses weight to control society". Richard Hammond, who chaired the judging panel, called it "astonishing" and "frightening". "The idea of the government using obesity as a controlling mechanism is such a fresh and original idea." Cake Wars told the story of a baking contest where the contestants sabotaged each other's entries. It was written by nine-year-old Emily Potts, who said it was inspired by her grandmother's "terrible cakes". London Pigeon was a first-person/first-pigeon account of a bird's life, while The Word That Wouldn't Come Out described a stammer from the point of view of a stubborn word, stuck in the speaker's mouth. Lara Akhurst's Blue was described by children's laureate Malorie Blackman as "a mature, personal story which I found immensely moving". Celebrities including Sir Kenneth Branagh, Jeremy Irons, Sally Hawkins and Charles Dance read out the short stories during the prize-giving ceremony. The event was hosted by the Duchess of Cornwall, who is a patron of the National Literacy Trust. "Whenever I have a chance - and I don't often get a chance to talk on Radio 2 - I tell everybody we must never forget how important reading and story-telling is," she said. "Like climbing though the wardrobe into Narnia, stories open doors into different worlds. "We meet impossible people, travel to remote places and make hundreds of new friends. "We look around with new eyes and recognise Horrid Henry next door or Professor Snape the chemistry teacher in the school down the road. "The best stories show us what we all have in common." An analysis of the 50 million words used in the stories showed that new technology featured strongly in children's imaginations. One of the most common plotlines in the short story competition was achieving sudden internet fame after posting a YouTube video; while #hashtags were incorporated into the stories with increased frequency. "Children are not tweeting and using Twitter, but they are using the word hashtag and the symbol # for dramatic effect, it is heightening tension," said Vineeta Gupta, head of children's dictionaries at the Oxford University Press. But the top 10 nouns were reassuringly related to home, family and daily life. You can read all the finalists, including the six winning stories, on the 500 Words website.